The campaign against Periodic Technical Inspections (PTI) or “NCT for bikes” has taken another step with the announcement by FEMA of an acknowledgement of the riders petition submitted last year. Our stance on Periodic Technical Inspection remains that it’s a hugely expensive way of fixing something that’s not broken. Studies such as the Hurt Report and the MAIDS study show that mechanical failure is responsible for only a tiny percentage of motorcycle accidents. Even the RSA accepts that it’s simply not an issue. Worryingly, the recent IMCO committee vote on Type Approval left Article 18 suggesting that substantial modifications “shall be inspected and approved by the competent authorities in the Member States.” In other words, by means of PTI style test for motorcycles, although lobbying on the Type Approval issue is ongoing at various levels. The petition campaign started in reaction to a public consultation held online from July to September 2010, where the European Commission asked citizens for their opinion on the extension of mandatory inspections to motorcycles. 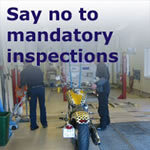 In countries where inspections are not mandatory for motorcycles riders immediately called their associations to react. Mr. Kallas confirmed that his staff is still working on the revision of roadworthiness testing legislation. Mandatory yearly inspections for all two-wheelers could be a possibility at this stage, even though nothing has leaked about the Commission’s intentions as of yet.The Commissioner also vowed to come back to FEMA to discuss the issue once a project is on the table. It’s wait and see until then. MAG Ireland will continue to monitor the situation with regard to Periodic Technical Inspections here at home, and through our colleagues in FEMA, at the EU level.